Batik is an ancient textile technique originating in Indonesia. Pattern is applied onto cloth using molten wax with fine brushes or tools called tjantings, before coloured dyes are applied to the fabric. In more recent years this highly decorative and colourful process has been used to create designs and images on paper. Join us on Monday 24th June and explore this vibrant process, creating a range of experimental samples and unique outcomes. You may choose to work with the themes of Florals or Abstract Pattern, or take inspiration from different cultural images; alternatively you may wish to develop designs of your own choosing. The workshop will be delivered by Alison Butler of Blooming Designs. 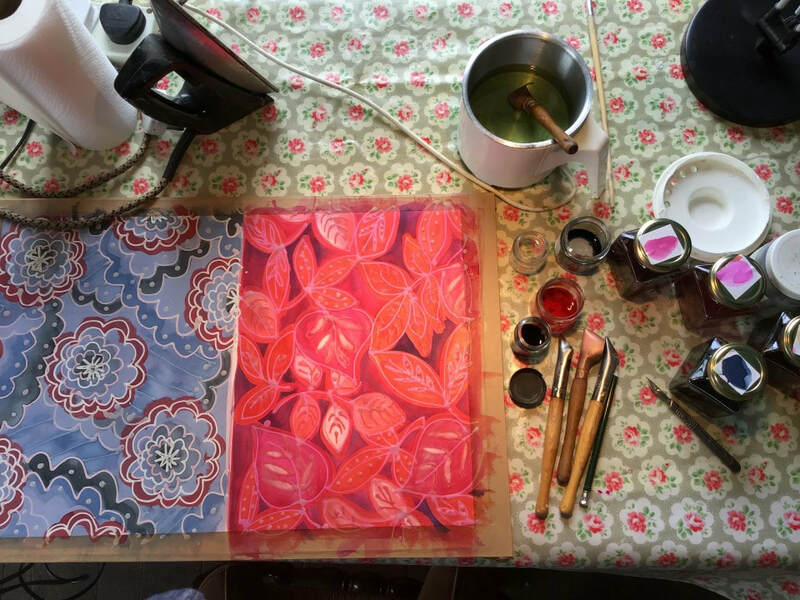 With over 25 years experience as a textile designer and book illustrator, Alison will guide you through a range of exciting approaches, where there will be few, if any, rules. This workshop is suitable for those with a range of skills and creative experiences, for a maximum of 10 people. Please bring along: an apron, optional - ideas/drawings/images related to the themes of Florals, Abstract and Cultures, a newspaper and an A3 folder to transport your work home and a pencil case. All materials and equipment will be provided; refreshments and delicious homemade cakes will be served in the barn. Please bring your own lunch. To be held on Monday 24th June, from 10 - 4pm at a price of £75.